Sea World’s Public image took a drastic hit a few years back following the release of the documentary “Black Fish,” but instead of resisting, Sea World changed it’s policies regarding their Killer Whales, ending the breeding program and taking steps to ensure the safety of their employees and guests. Bayside Skyride is a 1967 VonRoll type 101 gondola ride located in the northwest corner of the park behind the “Cirque Electrique” show. It travels over part of Mission Bay for a 6-minute ride on two 80-foot (24 m) towers, and lands on the other side before returning for a full loop. The Sea World Skyride has the longest span between towers out of any VonRoll Skyride ever built—925 feet (282 m). From 1967 to 1988, the Skyride was known as the Sea World Atlantis Skyride, and took riders to the Sea World Atlantis Restaurant which was located on the opposite end of the ride across the lagoon. After the restaurant closed, the ride remained, but took riders on a full loop, passing through the second station instead of stopping. Journey to Atlantis is a Mack Rides water coaster. The ride stands at a height of 95 feet making it the 2nd tallest attraction at the park after the Skytower. The boat leaves the station and climbs the first lift hill, once at the top of the lift the boat takes a small decline to pick up a little speed and then travels around a right-hand turn that leads to the first tower building. The boat then enters the tower, passes under a fountain, and plunges down a flume 60 feet into a small man-made lake of water. 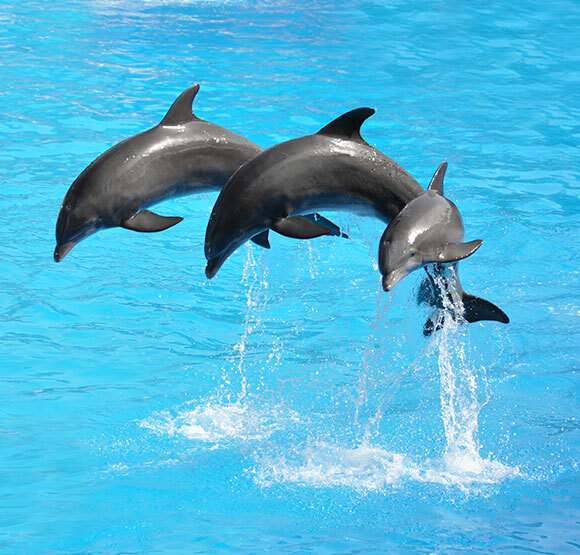 (Formerly Known as “Rocky Point Preserve”) The park’s popular bottlenose dolphins are on exhibit here in a multi-pool complex where guests have access to pet the dolphins. Guests can also interact with the dolphins during scheduled presentations of Dolphin Point Connection hosted by trainers that give them the opportunity to touch and give training signals to the dolphins. The Dolphin Encounter and Dolphin Interaction Program also take place at this exhibit. Adjacent to Dolphin Point is Otter Outlook, home to the park’s California sea otters. Sea Lion Point is home to 23 pinnipeds; 12 California Sea Lions, 8 Harbor Seals and 3 Guadalupe Fur Seals. Many of the animals were rescued and deemed non-releasable, born in the park, or are on loan from other zoological facilities in the U.S. Guests have the opportunity to feed the animals and have the opportunity to watch a feeding session done by the animal team. During the Sea Lions Up-Close Tour, guests have the opportunity to meet some of the resident animals, participate in a training session, feed and have a rare behind the scenes look of how the park cares for all of the pinnipeds. The Sky Tower is a 320-foot (98 m) Gyro tower that was built in 1969 designed by Intamin. The ride was refurbished in 2007 with a new capsule. The ride gives passengers a six-minute view of SeaWorld and San Diego. It rises at a rate of 150 feet per minute (46 m/min) while spinning slowly (1.02rpm). Sesame Street’s Bay of Play is an interactive children’s play area that opened in 2008 and is based on the long running Sesame Street children’s television series. 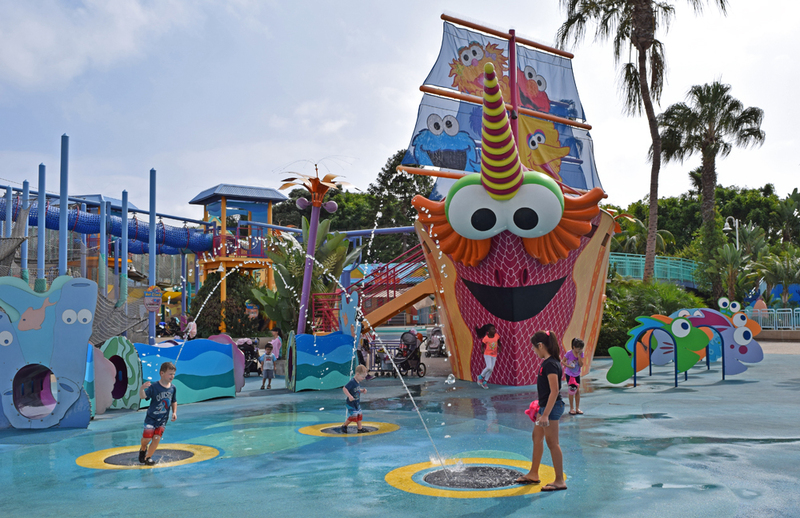 The area includes three rides: Abby’s Seastar Spin, a spinning “teacup” attraction, Elmo’s Flying Fish, an attraction in the style of Dumbo the Flying Elephant”, and Oscar’s Rockin’ Eel, an eel themed “Tug Boat” ride. Shipwreck Rapids is a river rapids ride themed to a shipwreck on a deserted island. At one point riders pass by a sea turtle exhibit. There is also a point where riders go underneath a waterfall into an underground cavern. Turtle Beach is part of Shipwreck Rapids and Shipwreck Reef Cafe. The turtles inside Shipwreck Reef Cafe are males and the exhibit outside of Shipwreck Reef Cafe, near Bayside Amphitheater, are females. During the Behind the Scenes Tour, guests are given the opportunity to feed the turtles and learn more about them. There are three species of turtles living at Turtle Beach: Green, Loggerhead and Hawksbill sea turtles. Turtle Reef is an attraction housing over 60 sea turtles in an aquarium with a variety of fish. In the aquarium is an interactive game called Race for the Beach, where guests can play as sea turtles on a mission to their nesting grounds. At the exit of the aquarium is a ride called Riptide Rescue, which is a spinning flat ride themed after rescue rafts. Shark Encounter is a multiple pool exhibit featuring a variety of sharks as well other large fish. The first pool features medium sized sharks, including Black and White Tip Reef sharks, Nurse sharks, Bamboo sharks and Zebra sharks. The second pool, which is the largest, features larger sharks, including Sand tiger sharks, Zebra Sharks, Nurse sharks, Black and White Tip Reef sharks, a Lemon shark, a Goliath grouper, as well as a variety of fish. The third pool features a variety of animals, including Bonnethead sharks, Leopard sharks, Zebra sharks, Tarpon, and a variety of fish. Directly across from the third pool is a touch pool style pool containing baby bamboo sharks, however guests are not allowed to put their hands in the water. As guests continue on, they will be able to walk through a tunnel at the bottom of the second pool. Wild Arctic is a simulator ride through the Arctic set in a giant helicopter. It features both a simulator or the option to go straight to the exhibits. After the ride, guests can view animals of the Arctic from both underwater and above. The first exhibit features three adult beluga whales and two adolescent beluga whales. The second exhibit normally features polar bears, however, seals are currently on exhibit. The third exhibit features one female and two male pacific walruses.. When guests continue on, they will be able to view the harbor seals and beluga whales from underwater. Ocean Explorer is a new realm that opened on May 31, 2017. It includes several animal species, including California moray eels, Japanese spider crabs, Porcupine crabs, Giant pacific octopuses, Pinecone fish, and Snipefish. The realm also includes five rides: Tentacle Twirl- a swing ride themed as a jelly fish, Aqua Scout- six mini submarines that spin and bounce, Sea Dragon Drop- a child sized shot-n-drop tower, Octarock- a swing that moves back and forth, and Submarine Quest- the area’s signature attraction where guests can go on a mission of scientific discovery. 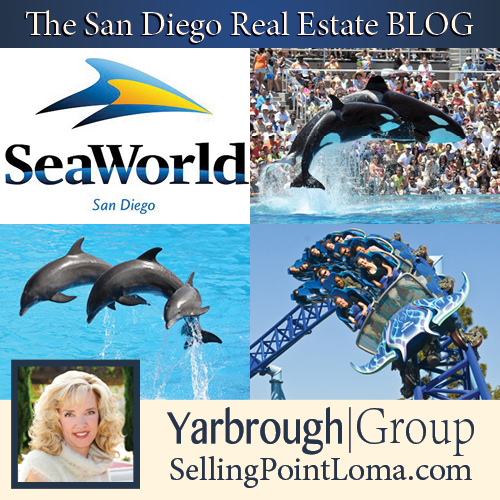 Did You Know Sea World has roller coasters?! 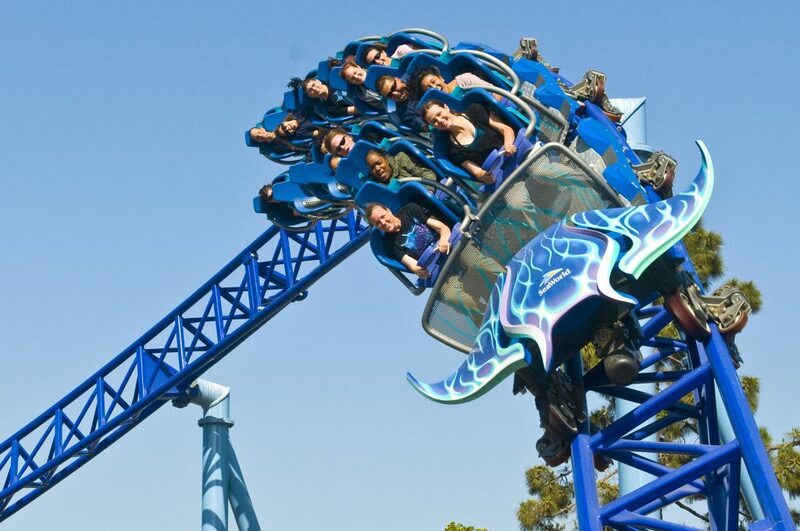 On May 26, 2012, SeaWorld San Diego opened a new mega-attraction called Manta, a Mack launched roller coaster featuring two launches LSM of up to 43 miles per hour (69 km/h) accompanied by a bat ray aquarium and touch pool. A shallow pool for touching bat rays, white sturgeons, and shovelnose guitarfish lies at the entrance of the attraction while two-sided underground aquarium (for riders and nonriders) can be accessed downstairs or via the queue. Manta begins with 270 degree projected media experience at the first launch. The train rocks forward and backward in synchronization with the projected film of a coral reef and school of rays. The two-minute, 2,800-foot (850 m) long ride stands at a height of 30 feet (9.1 m) and features a drop of 54 feet (16 m). The layout is characterized by multiple turns, short but sudden drops, and crossovers. 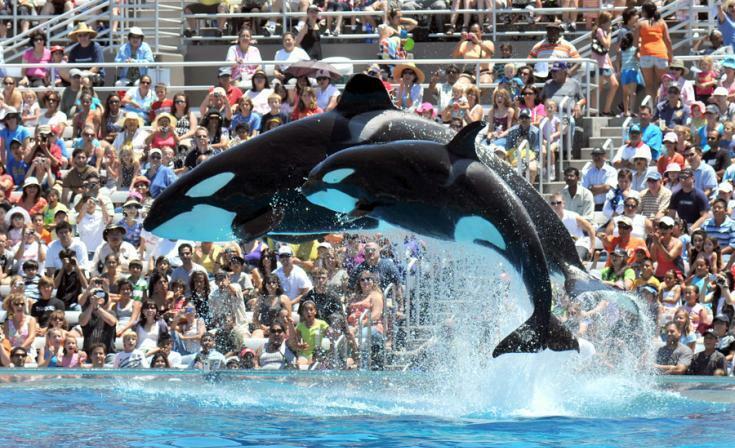 SeaWorld San Diego is home to four different aquariums. Aquaria: World of Fishes features both fresh and saltwater fish, including Piranhas, Alligator gar, leopard sharks, and many tropical marine fish. Aquaria: Tide Pool gives guests the opportunity to feel and meet tide pool creatures. Freshwater Aquarium features a variety of freshwater animals, including Electric eels, turtles, Poison Dart frogs, and many other freshwater fish. Aquarium, formerly known as Aquarium de la Mer, features cephalopods, including multiple species of octopi, cuttlefish, and nautilus. SeaWorld’s Animal Care Center has different pools and facilities needed to care for rescued animals and continue their process of rehabilitation and release back into the wild. The main center is on the west side of the park, behind Shipwreck and Bayside Amphitheater. The center has pools to house rescued cetaceans or temporarily house resident cetaceans (health needs, pregnancy, temporary home), kennels to house California Sea Lions, Harbor Seals, Guadalupe Fur Seals and Elephant Seals, small pools to house new animals in quarantine and Sea Turtles, a small pool that is used for space, for around the clock care or to temporarily house the park’s Sea Otters or Sea Turtles and a aviary that houses African Penguins, who are used for research. There is also two areas that used to house a Flamingo Breeding Area and a temporary bird exhibit but is currently housing Hawaiian Geese and other duck species. The main center also has the medical and surgical office, the fish room and the SeaWorld Rescue office. This area is accessible for guests only who take the Behind the Scenes or Sea Lions Up-Close Tour but it can be seen from the Bayside SkyRide, Bayside Amphitheater and Shipwreck. The SW Rescue boat and vehicles are also parked here. The other, known as the OWEN center, is located on the east side of the park, behind Penguin Encounter. This facility has aviaries that house different bird species that are rescued and in the rehab process but there are also aviaries that houses Flamingos, clapper rails and other bird species and this center also has a inflatable pool and a small pool and the bird center office to care for the rescued birds and newborn hatchlings. This area is only accessible to the rescue team but guests can get a glimpse of it if they do the Penguins Up-Close Tour, the Behind the Scenes Tour, next to the exit of Penguin Encounter and behind Nautilus Pavilion. The park currently has some absolutely fantastic deals going on. San Diego residents can currently get a $99 annual pass than includes unlimited access to the park, free parking, and guest passes. If you have kids, this deal is not to be missed. As always, a portion of all Sea World revenue goes to continue their mission of rescue, rehabilitation, and conservation that has helped over 31,000 marine animals to date.